0 Comments Published by daveterry on Thursday, October 20, 2011 at 1:04 AM. Where does a person go for a vacation when they already live in an exotic place like China? Well, how about another exotic place like, for example Thailand? We needed a vacation. China is full of noise, construction, people, and congestion. Thailand might be better, right? Not Bangkok. It's just as noisy, congested, and peopled as China. But at least the vendors are friendlier. Oh, and it has more water, lots more, especially lately. As we walked through the city streets and markets, water from the river cascaded down stairs, swirled around our feet, and ran off into the street drains. We took a two hour dinner cruse up The River of Kings and enjoyed local Thai cuisine, the names of which I can't begin to pronounce nor read from the menu. "Yeah, I'll take one of those" I say as I point to one of the items. When it does come I recognize the items as scallops, shrimp, mussels, and stir fry in curry and coconut sauces. Everything is delicious and perfectly prepared. And so they deliver it to the table. I take a picture, eat it, and order another item. This continues for the entire two hours, ending in a selection of deserts, coffee and finally a Thai Rusty Nail. Don't ask. It's always scary when you have to tell the bartender what's in a drink and then discover they only have a local scotch. 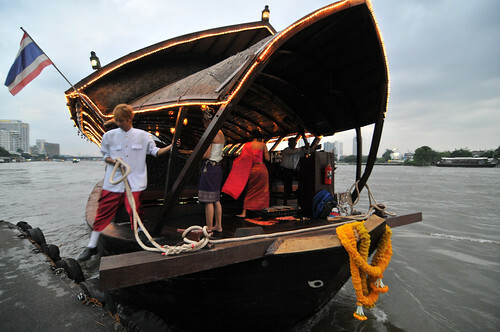 The entertainment included traditional Thai music and dance. But frankly we were more interested in the new friends we met sitting across from us and all the stories they had to tell. We clapped politely when the dancers were finished but then quickly went back to our intense discussion. It's rarely the place but often the people that provide the most absorbing and engaging experiences.